With Incognito orthodontic braces, no one will even know you are wearing braces! These unique braces are placed behind your teeth and created using state-of-the-art technology. 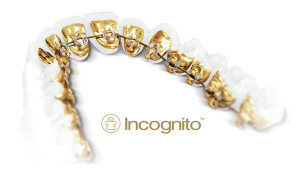 Incognito braces are the only 100% customized, invisible, fixed braces system on the market today. Working just like traditional braces, lingual braces straighten a patient’s teeth within the same amount of time metal braces would. Your teeth are used to make an impression. Then, a laboratory will use computerized technology to create the metal brackets to fit onto the back of each tooth. These brackets are cemented into place by your doctor and you’re on your way to a beautiful smile without anyone noticing! Just about anyone! If you can be treated with traditional braces, you are a good candidate for Incognito braces. Incognito braces are comfortable because they are custom-fit to each patient. Plus, they are a great option for both adult professionals and teens who would feel more confident with invisible braces. Incognito braces can also be extremely convenient for those who play wind instruments or contact sports.